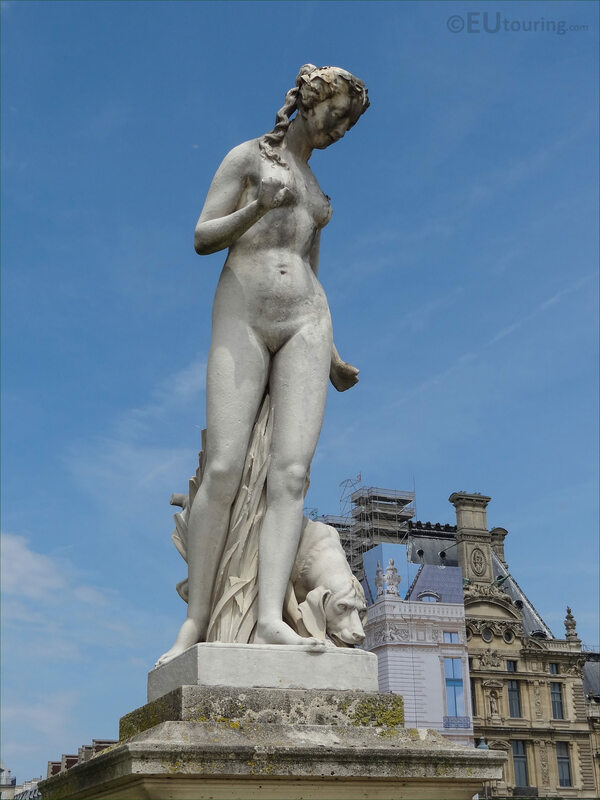 We were in the 1st Arrondissement of Paris at the Jardin des Tuileries, when we took these high definition photos showing a statue called Nymphe, which was sculpted by Louis Auguste Leveque. 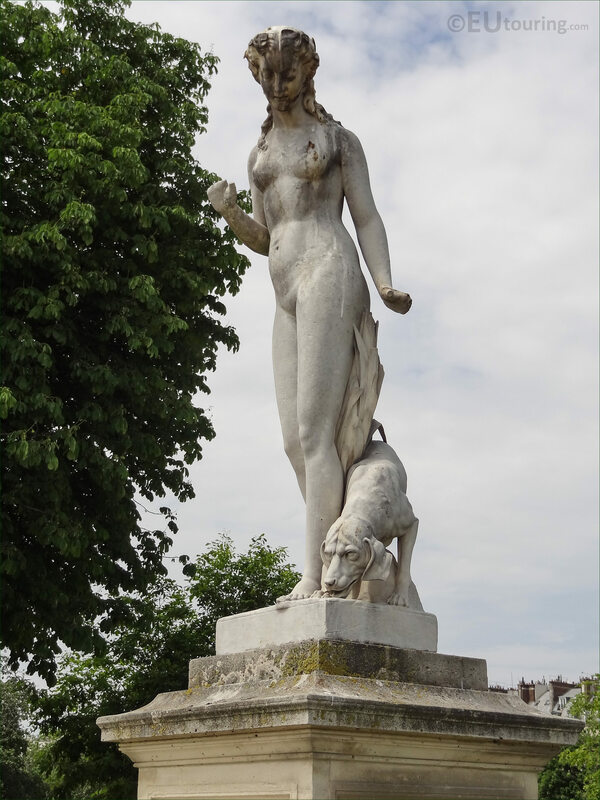 This first HD photo shows a statue called Nymphe, which is spelt Nymph in English, and in Greek mythology she is classed as a minor female nature deity, who is imagined as a beautiful young woman that inhabited places of nature such as forests, springs, etc. 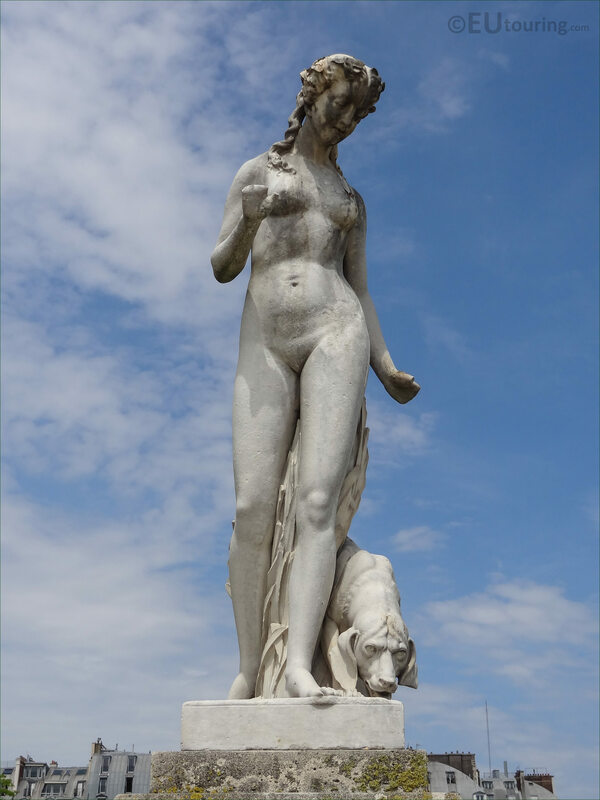 Now here you can see a closer view of the Nymph statue, which was sculpted in marble back in 1866 and portrays a naked female figure with a dog at her feet, and it was during the Second Empire when Napoleon III was Emperor, that he decided to have additional statues added to the Tuileries Gardens. 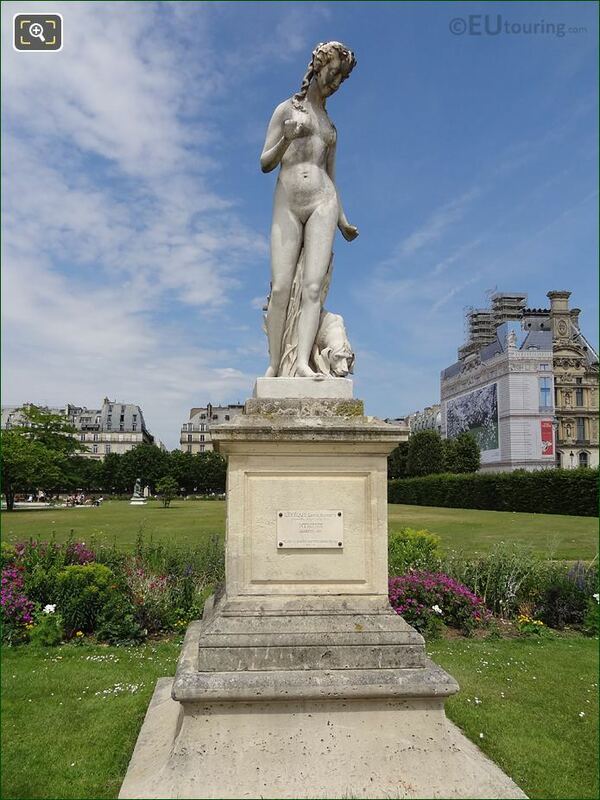 The Nymphe statue is located within the Grand Carre area of the Tuileries Gardens, which is the low lying symmetrical formal design section of the Jardin des Tuileries, a part of which was partitioned off as the private garden of Emperor Louis Napoleon when he was in residence at the former Palais des Tuileries. However, Louis Napoleon never got to see some of the statues including this particular statue of the Nymphe put in place within the Grand Carre area of the Jardin des Tuileries, as he was defeated and captured during the Franco-Prussian War in 1870, and this one was only put in place in 1872 during the Third Republic after the Monarchy was abolished. 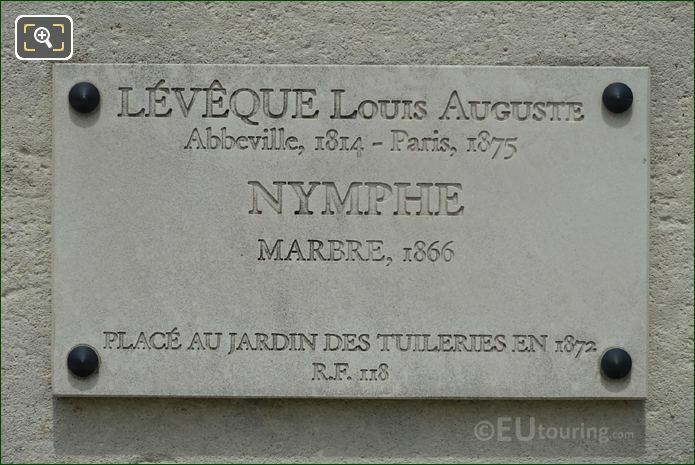 You will find that the Nymph statue was sculpted by Louis Auguste Leveque, who is a very little known artist, but according to the Bibliotheque Nationale de France, he was born in Abbeville in 1814 with a full name of Louis Auguste Edmond Leveque. 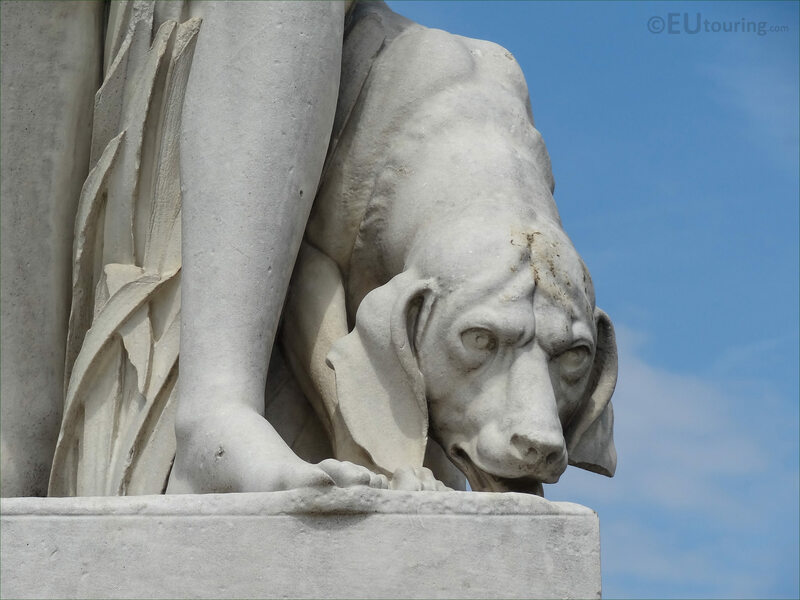 And the above image shows a close up of the dog with its impressive life-like detailing that went into producing this statue, although unfortunately very little else is known about Louis Auguste Leveque, yet he resided in Paris for the majority of his life, which is where he passed away in 1875. 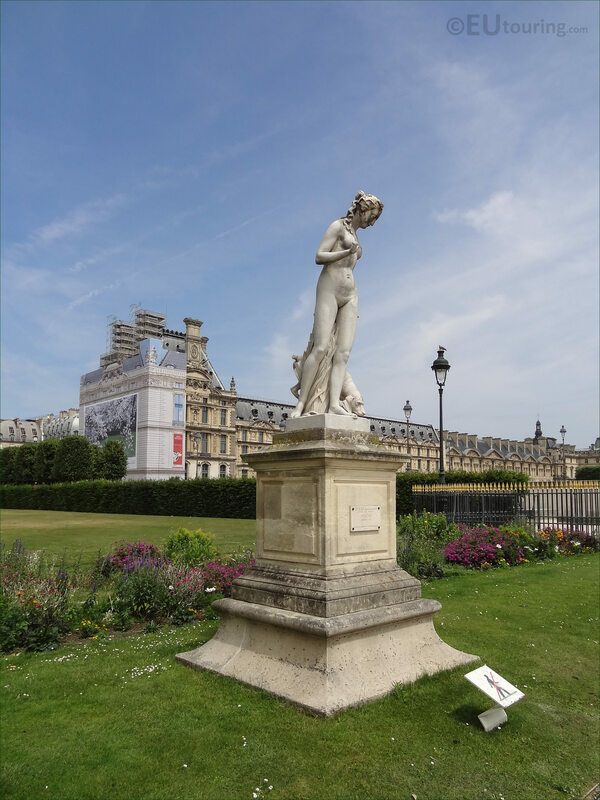 Yet here you can see the entire marble statue of Nymphe positioned on top of a tall pedestal next to the parterre with its flowerbed border called the Grand Reserve nord, and this faces on to the Allee Centrale of the Tuileries Gardens, which is where we were standing when we took this photo. 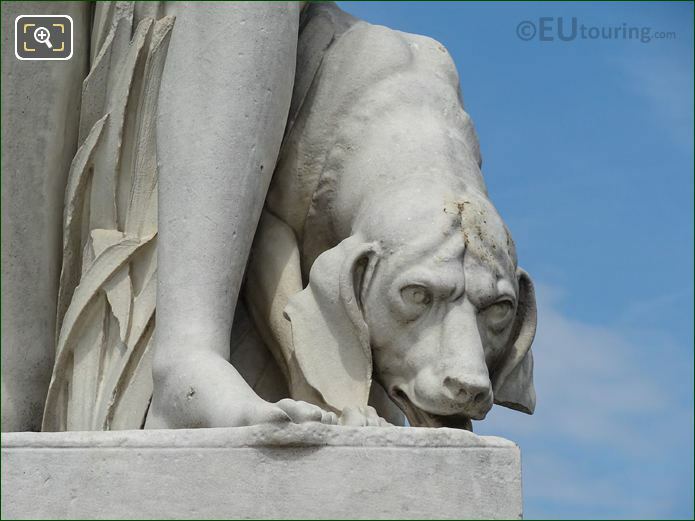 However, this close up photograph above shows the tourist information plaque located on the pedestal base of the Nymphe statue, which as you can see, has an inventory number of R.F. 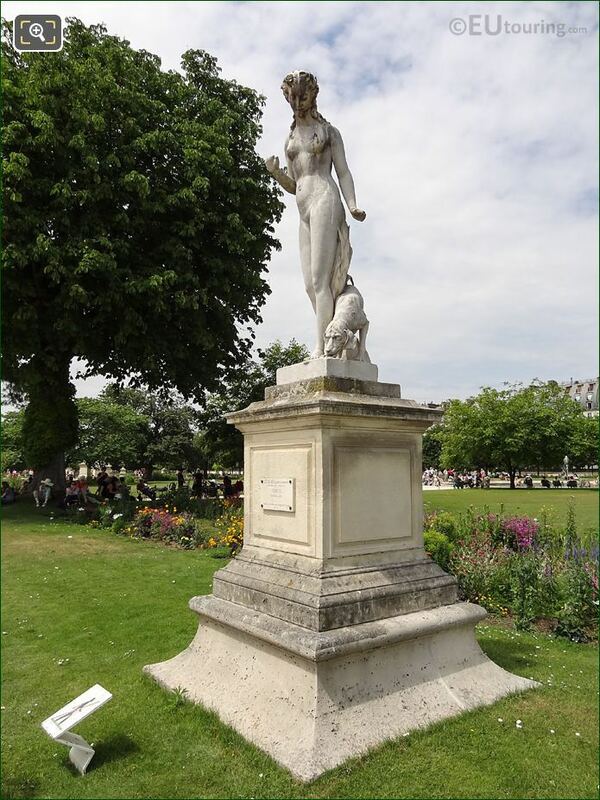 118 and as we stated before, this was originally placed within the Tuileries in 1872. 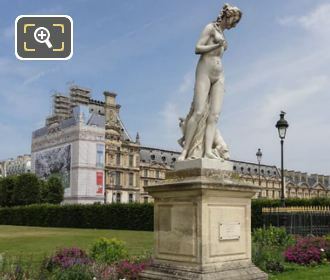 Although here you can see that the Nymph statue is also located very close to the gilded railings by Grille Lemonnier of the Jardin des Tuileries, which leads up towards the terrace and the Jardin du Carrousel, before you carry on towards the main courtyard of the Louvre Museum, who now manage these impressive former royal gardens.